The 2019 Marketing Technology and Operations Salary Survey, in partnership with MarTech Today and chiefmartec.com, features compensation and job function data from the more than 350 respondents who work in marketing operations roles that we qualified out of the more than 900 marketers who answered our survey. Marketing operations is tightly woven into the fabric of today’s marketing teams. Marketing operations is a lucrative career path, with the majority of respondents saying they have received a promotion within the past 2 years. Martech is not for techies. Most marketing ops professionals have degrees in business or liberal arts, not computer science. Martech can do better, as gender pay gaps still exist, especially at the six-figure range. Join the martech community and tackle transformation at the intersection of marketing and technology. 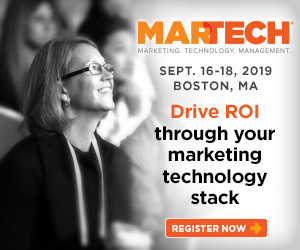 MarTech is the only conference that delivers a vendor-agnostic, graduate-level marketing, technology and management perspective designed to help you succeed. View pass options and register now!